I am reminded often that blogging has become a medium for us to present our “best selves”: from detailing homemade crafts to posting stunning photos of our kids, a blog can become a show-and-tell for moms that glosses over the hard parts with good lighting and soft filters. I love reading blogs and feeling inspired – really I do – but I sometimes wonder how all of this is setting up our expectations for the daily grind of motherhood. So I’ve decided to host my own linkup/blog carnival/McLinky/what-have-you. And instead of asking you to link back to your best recipe or your cute homemade birthday party invites or your adorable handmade . . . I’m gonna ask you to link back to a post where you are keeping it real. Maybe you’ve had poop flung at you from the tires of your son’s bike, or dropped raw egg on your shoe, or flashed the audience of a circus while nursing, or spilled a drink down your pants at your child’s birthday. Or maybe it’s just me. I absolutely loved reading through all the links last time – thank you so much to all of you who played along! For my own confession this time around, I’d like to highlight some of the technical challenges that I live with on a daily basis. First of all, my phone. Not even sure where to start with this one. I started using a Palm Pilot back in the 90’s, when it was considered to be an up-and-coming gadget. (Don’t judge me. So did you). I was first in line when Palm started making a phone combo. The problem is, I have never converted. My Palm has all my work contacts, my friends’ addresses, my schedules and birthdays, and I am just way too intimated to switch to another phone. EVEN THOUGH I KNOW THEY ARE BETTER. Also, my carrier doesn’t even make Palm phones. So I keep buying used Palm phones on ebay, and they keep breaking. (Or I drop them in water. Same diff). Currently, I have one semi-working phone, that often powers off in the middle of conversations. But it doesn’t charge the battery. So every night I pull the battery out of the (semi) working phone and pop it into an older model that no longer works at all, except to charge the battery. Classy? You betcha. And then there is the state of my card reader. Our family television has white lines that cover half the screen. The DVD player breaks every couple of months and we have one techy friend who graciously fixes it for us. The rest of the time we plug in the kid’s portable DVD player. Also, my photo-editing software? Microsoft Paint. The one that comes free with the computer. That’s all I know how to use. (Let’s not talk about how long it took me to convert to itunes). And why are her lips so red, you may be asking? Oh, that’s because she likes to eat magic markers. And I find her (or Kembe finds her) huddle in a corner eating a magic marker every day. Since we’re keeping it real, let me also confess that she has often gotten through several colors by the time she is discovered. All right, your turn. Let us in on some of your real moments. It can be a new blog post or one you’ve written in the past. (Doesn’t have to be about technology, just has to be honest). The final button is below, if you wanna grab it for your own post. Oh, and how could I leave you without some stunning photos of my St. Patrick’s day creation? Totally irrelavant but does Karis not have to wear her helmet anymore?? 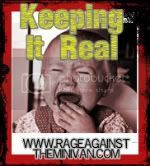 What is so "real" about a crying baby? A baby greased in poop, okay. Family dinner in a fast food restaurant because the kitchen looks like a mess, okay. etc. but why taking photos of crying children and then posting them on the net? I dont find it funny when my children cry and as long as i am in the condition to, i do try to comfort them. in any way, i dont take pictures of them. i would be very pissed, if someone took pictures of me while i am having such a hard time, that i have to cry. and Linda Berry: there is nothing good about a selfless mom. Why should moms not look out for what's best for them, too? Since when does the principles of "giving" work without taking? Looks like Johanna woke up with out her sense of humor today. She must be too uptight to really "keep it real". Sure sounds like it to me. Joanna (aka sense of humor police) – the point is that it's not a happy, smiley posed shot with a clean face and fantastic lighting. It wasn't meant to be funny as much as it was meant to contrast the perfect photos of children usually used online. (Like the shots that are gracing the top of the blog, which are pretty but not representational of every day). I promise I did comfort her and actually wipe her nose . . . eventually. I think she'll be okay. Especially since, in every shot, the source of her "trauma" is that I removed a magic marker from her hand that she was trying to digest. Which *is* a real and daily moment in my house. But really, why am I having to defend myself over a silly picture? Please take the criticism elsewhere. I'm trying to keep this a shame-free zone. I really think then you should change your pic to vials of poop if a picture of Karis crying offends some people ya know. Seriously the point is Kristen is keeping real b/c it is not roses all day and kids cry…. Your doing a great job…my hat's off to you and Mark! Keep it real and keep up the good work! I'm in your court, people who think life is smooth and grand needs doctor…life is life and there's no getting around it, sometimes it just happens and "keeping it real" is the only way to get through it!! I stopped along time ago trying to being perfect, I even let my son off the hook about trying to be perfect…so the pressure is off him too "not to be perfect"!!!! Great Blog today !! She is helmet-free! To be honest, she didn't exactly graduate. But it required meticulous cleaning that just didn't happen when we were in Haiti post-earthquake. By the time we got back to the states, it was pretty well ruined, and we decided not to buy another one. Her head shape seemed so insignificant after all of that! Her head is still a little football shape, but I'm hoping it's less noticeable as her hair grows in. I'm loving the links, but can't share my own 'keeping it real' moments, because we're on the verge of actually bringing our kids home from (their country in africa) and we have to maintain our illusion of perfection for a little while longer! because I can't really 'keep it real' on my blog, I've chosen not to blog at all for the time being. loving yours though, thanks for the good times! and i'm so tech remedial i don't own a laptop or ipod, and i've only had a cell since just before my 2 year old was born! the red lips is the most "keepin' it real" thing I've seen all day 🙂 Today was a day where I truly questioned if my 3yr old has turned into an alien with no conscience and if I am a fatal screw-up at mothering so this post could not have come at a better time for me. The whole giant chocolate bar began the healing, but your post brought the healing to its completion! P.S. LOVE the green pudding! Psst. Don't tell anybody. I don't have an iPod. I think I'm the only one. But don't tell! It will ruin my facade! Anywho, I don't have a good blog post since we also have to live in Perfect-ville while social workers are a part of our day-to-day lives. 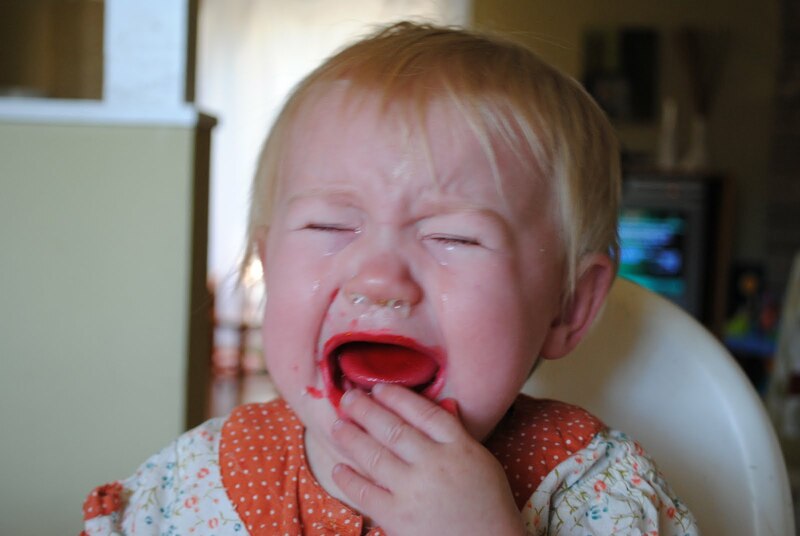 But know that I *do* find the humor in the picture of Karis all snotty and crying. Because that's a part of my every day reality. I'm joining in late, but I'm all about keeping it real! Thanks for doing it again!! Oh my gosh, this post makes me feel so validated. I always feel so lame because we don't text (tight SAHM budget so we're cheap and don't want to upgrade plans), just got cable and our own (non work) computer 4-years ago and don't even have an iPod. I always see blogs like yours with twitters, videos, etc. that seem so tech savvy and it makes me feel so inadequate. I'm glad to know behind that tech savvy facade is someone also somewhat technology challenged like me. ha! kristen, personally i think you are a genius in the tech world. the main reason is b/c you have a blog and you know how to put photos on it, add an entry everyday and include links and such. me? i just use the comment section of your blog everyday and pretend it's my very own blog. that's the best i can figure out. i have good friends who call me "claire" – if you're a fan of the show modern family you will know why. i am so techno challenged that my kids have to work the TV for me. i am a photographer, but my editing program? yep, the free one that came with the computer. the DVD player or DVR? forget it. not a chance i know how to work those. my phone? an old fashioned flip phone that doesn't even have a keyboard *gasp*!! !